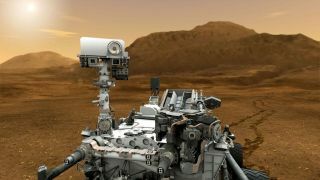 NASA's next Mars rover, which is cruising toward an Aug. 5 landing, is a whole new breed of Red Planet explorer. You can tell just by looking at its huge and powerful robotic arm. The 1-ton Curiosity rover, which is the centerpiece of the $2.5-billion Mars Science Laboratory (MSL) mission, is the size of a Mini Cooper. Its arm is longer than most people are tall, clocking in at 7 feet (2.1 meters). A bulky toolkit at the end of the arm will allow Curiosity to study and manipulate Martian rocks and soil like no previous rover. One of the tools is a drill that can go 1 inch (2.5 centimeters) deep, enabling the rover to access the interior of Red Planet rocks. Curiosity's main goal is to determine if its landing site, the 96-mile-wide (154 kilometers) Gale Crater, can or ever could host microbial life. The arm hosts tools both old and new to aid in this quest. The venerable Alpha Particle X-Ray Spectrometer (APXS) — which was used on the previous Mars rovers Sojourner, Spirit and Opportunity — will return on Curiosity with even better sensitivity, more schedule flexibility and better control. Contributed by the Canadian Space Agency, the instrument bombards samples with alpha particles and X-rays and measures the energy of the X-rays that bounce back. APXS will help scientists determine what minerals each sample is made of. Typical rocks on Mars include the elements of oxygen, silicon, aluminium, iron and calcium, Vasavada said. If water previously touched the rock, APXS could see elements such as sulphur, zinc, bromine, chlorine or phosphorus. Another one of Curiosity’s arm instruments is the Mars Hand Lens Imager (MAHLI), which is essentially a 2-megapixel off-the-shelf digital imager that has macro capabilities. The purpose, said Vasavada, is to look at rocks closely enough to see grains. “It allows us to get 10 to 15 pixels (of resolution) across every single grain. Then you can talk about the shape and color of it,” he said. Curiosity’s 10 science instruments (some of which are located on the arm, some inside and some on the rover) have a mass of about 165 pounds when taken together. That's about 15 times the mass of the five instruments Spirit and Opportunity each carried to the Red Planet when they landed in 2004.